I’ve wanted to write about one of my recent reads for quite a while now, but couldn’t get around to it until now. 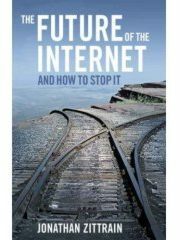 The Future of the Internet, and How to Stop It by Jonathan Zittrain is an intriguing read about where we’ve been in our computing history and development, and where we’re heading. He is not trying to stop the Internet from having a future, rather he is trying to stop the Internet from evolving into something very different from what it has been. Basically, this is the net neutrality argument explained with great detail in understandable terms. But it’s more than just that. The only part of the book that this post will deal with is a small portion of his material dealing with tethered appliances and generative (vs. non-generative) devices. The part that I find ironic is probably perfectly obvious by now. No self-respecting geek or pseudo-geek (I put myself in that category) would have been caught dead subscribing to AOL or Compuserve when the wide open Internet was just sitting there waiting for them to shed the bindings of the proprietary service providers. However, these same geeks and pseudo-geeks can’t wait to get their hands on the iPhone. Zittrain ties it altogether on page 106. “Indeed, recall that some recent devices, like the iPhone, are updated in ways that actively seek out and erase any user modifications. These boxes thus resemble the early proprietary information services like CompuServe and AOL.” I think it’s funny that the iPhone fanatics don’t look anything like the old AOL and CompuServe fanatics. Zittrain’s book deals with much more than what is included in this post. 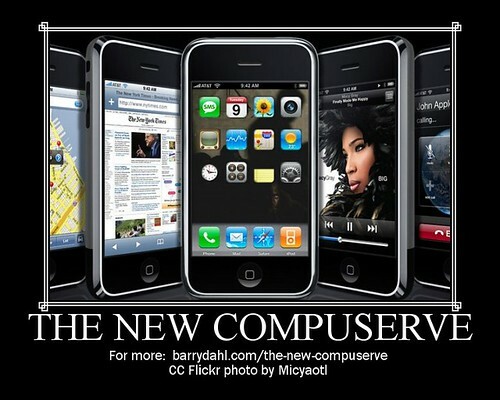 I highly recommend it, except maybe to the iPhone fanboys who might not like being compared to a CompuServe fanboy. This book is available for free on the Internet, although you can also buy a copy in almost any bookstore. I got mine at Amazon. This makes sense if the only plane of comparison is by looking at the aspect of can you hack it. Compuserve and AOL did not innovate the internet experience, they recast the experience other pioneers were having in the open space into one intended to make it “easy” for the common folk. If you and other Apple haters can take off the thorn in your sides, the iPhone as a technology platform (disregarding the service) is ground breaking in the networked connected device with a touch interface. That’s funny, because I have added about 50 programs in the 8 weeks I have owned one. I can already hear the response how Big Steve and Apple are being so tight clamped on developers. I don’t necessarily like how tight that seems to be, but I am not suffering in any way form being able to customize the iPhone. I dont like the AT&T lock in. I guess the part about Steve reaching in and wiping out my phone is not something I can stand behind, but it is not something that keeps me up at night, or gets in the way of the ways I am using the technology. I dont expect different sides to agree on this, but I see a whole lot of religious zealotry of If You Cant Open It Up and Freely Hack It, There are many devices I use successfully without that use needing to hack it. I am a fan boy, you are not. The world is still okay. What is actually ironic is that Zittrain’s book (published in April 2008) and his claims about the iPhone that you quote above ceased to be true by July 2008, when Apple released the iPhone 2.0 firmware update. Today, statements like “You are not allowed to add programs to the all-in-one device that Steve Jobs sells you. Its functionality is locked in though Apple can change it through remote updates. …The machine was not to be generative beyond the innovations that Apple (and its exclusive carrier, AT&T) wanted. Whereas the world would innovate for the Apple II, only Apple would innovate for the iPhone” are all blatantly false. You can add programs, the functionality is extensible, and thousands of developers outside of Apple are building innovative applications for the iPhone. Like the personal computer, it *is* a platform, and, arguably, it’s the most successful platform for a handheld computing device to date. I think the lesson here is less about iPhone fanatics and more about the half-life of sweeping claims in this quickly-changing industry. I think Greg makes a point. The App Store changes the game some. Sure it’s not as open as Android – but (and I continue to claim, in my best Nixonesque manner, “I am NOT a geek!”) as someone who appreciates things that “just work” – the experience of the iPhone has more than met that expectation – and the “command and control” nature of the App store model continues that (for the most part). And that is a trade-off I can live with (good experience where things “just work” versus 20m of tinkering – and those dreaded calls to tech support) at least for now. Note – I’ve need in a strategic planning meeting the past two days talking about portal. My epiphany – the iPhone is MY enterprise portal – not the command and control lock down my IT folks coerce me into – but one I can mash-up any number of “apps” in. And I can do that because I’ve “out-sourced” the standardization to Apple. Hey. I don’t care what anybody says, the iPhone (and iPad) will always be the best. Howdy. Initial I wish to say that I genuinely like your webpage, just discovered it last week but I have been reading it sometimes since then. Thank you for the wonderful web site and I hope you maintain up the great do the job. If you do I will continue to read it. Ample article. Individuals constantly endeavor to convey the plain although it is inessential but not you, Grand job!